On the heels of my update about Rachael Ray's success in growing the viewership for her talk show, I learned that the news is even better than I thought. Broadcasting and Cable reports that Rachael got her "her highest-rated show of the season Feb. 14, averaging a 3.3 rating/9 share in the Nielsen metered markets." These numbers mean that Rachael got a 38% bump from the average number of people watching her timeslot a year ago. Taking the New York market as an example, Broadcasting and Cable found that Rachael's talk show "hit a 6.8 rating/16 share at 10 a.m. on WABC, more than double its February 2006 time period performance in the top market." Yowzer. However, the huge numbers probably have something to do with the huge winter storm that kept people at home and in front of their TVs. 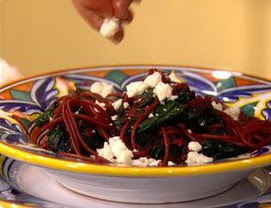 Rachael also made one of her most popular recipes on the Valentine's Day show: Drunken Pasta with Beets and Swiss Chard (pictured above). It's similar to the dish she made when she won Iron Chef, but I can't bring myself to try it. Why? Well, I can't use an entire bottle of wine just to boil pasta in. I just can't.